The Rally2Raise Nissan Micra will contest its third event next weekend (14th April) when driver Rachel Medich and co-driver Katherine Begg take part in the Coltel Granite City rally. The event will be the first time Katherine has ever competed but she has had intensive training from Rachel who, up until this year, was usually to be found in the co-driver’s seat. "As the day draws nearer to my first competitive event the nerves are obviously kicking in but at the same time I’m also very excited to be part of Rally2Raise and all it is setting out to achieve, especially the awareness raising of causes very dear to me personally," said Katherine. 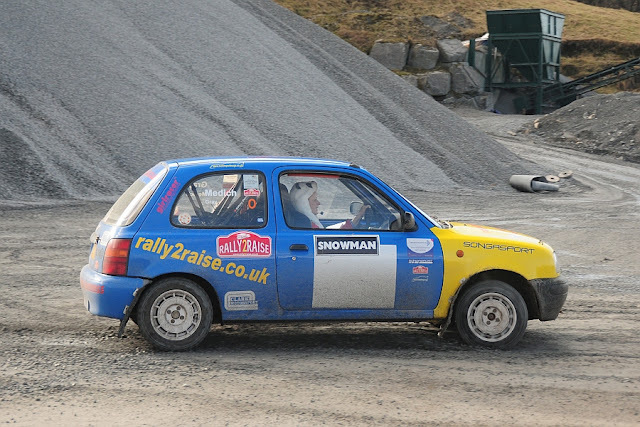 "I am normally with a rescue unit at rallies so it is going to be extremely weird being in a rally car rather than sitting in the unit watching, and sometime rescuing, them." "Rachel has given me loads of tuition so hopefully I will be ok once we get going and I’m sure it will turn out to be very enjoyable." The organisers of rally, Aberdeen and District Motor Club, have generously donated an entry to the event for the Rally2Raise team. Rachel commented: "It was a fantastic offer by the organisers to give the team an entry. The Coltel Granite City rally is my local event and it will be an honour to take part." "We have had some really good press coverage locally and getting the car out on the event will help raise even more awareness for the Rally2Raise project and our four supported causes – the Nystagmus Network, the Joanne Bingley Memorial Foundation for post-natal depression, Cancer Research UK and the MS Society." The rally will be based near Inverurie with around 44 miles of competitive action in the forests of Kincardineshire. Please visit www.rally2raise.co.uk or www.facebook.com/rally2raise for more information on the project. Donations can be made online via uk.virginmoneygiving.com/rally2raise.